Missing a simple teeth cleaning appointment every now and then may not feel like the end of the world. But there are three very important reasons your semi-annual trips to a Columbia dentist will pay off big time. Dentistry is all about prevention…and buying time. The sooner you treat something, the longer it’ll hold up and the more time you’ll have until it inevitably needs more work. 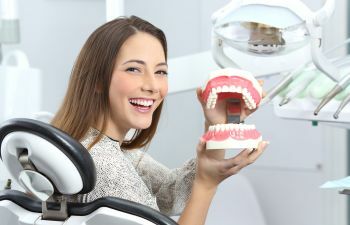 At your routine dental checkups, you’ll have exams, x-rays, photos, and other diagnostic services to help you determine your risk for dental disease. In addition, most cases of oral cancer are first detected in the dental office as part of a thorough examination. Those cleanings do more than make your teeth sparkle! Professional dental cleanings remove tenacious tartar, or calculus deposits that a toothbrush and floss can’t remove. By getting rid of that tartar and plaque bacteria, your teeth have a lowered risk for decay and your gums a lower risk for gingivitis. A dental office is not a car wash. This isn’t an in-and-out kind of deal. While you’re here, you get to take advantage of the chance to learn tips for keeping your mouth as healthy as possible. This, by extension, keeps your whole body healthy. Two dental visits per year may not be enough for you, depending on your circumstances. With a dentist or dental hygienist’s recommendation, you may need to come in three or four times. Time to schedule those dental appointments? Give our team a call today here at Columbia Dental Center.